1999 The Lake Placid Soccer Center website debuts on the net. Camp Director Mike McGlynn poses with Lauren Gregg and the Women's World Cup in front of the Whitehouse at a ceremony honoring the FIFA Women's World Cup winners - Team USA. 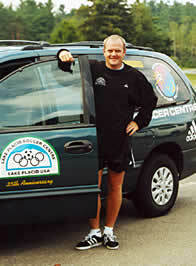 Mike managed the Coca-Cola youth programs for the '99 World Cup. Have wheels will travel - Camp favorite coach Stewart Hemsley with LPSC van. The van means that day camps will become a regular feature of the LPSC outreach for the new millennium. LPSC will come to your community.